We all know Craiglist is a fabulous American classified advertisement website. And that is the reason you are looking similar websites expecting something better. So we would like to tell you are absolutely right. There are lots of websites like Craigslist and have much more targeted audience. We compile a list of all best Craigslist alternatives that will help you to buy and sell used items, Services and allow you to participate in the discussion forum. Do you know there is a certain percentage of people who do not want to use craigslist due to scam and no law enforcement on the deal? This happens because it is a free classified website where buyers and sellers make the deal independently. Due to its popularity and high volume of users, scammers are looking opportunity to make money by cheating genuine customers. Despite all of this, it is a good website and there are many ways to make money on Craigslist. You can sell your Artwork, Services, and Goods. Here are the list of some Craigslist Alternatives and some people even claim that few of them are even better than Craigslist. FreeAdsTime covers a wide range of areas and categories and this makes it a great candidate for this list. The quirks and features offered by this free classified ads site are quite appealing and this certainly is an ideal place to deal locally. Start browsing through it now! FinderMaster has been a top pick on a number of Craigslist alternatives articles and my guess is that its contemporary look and feel has contributed to its fame. A clarification I need to make is that its look alone by no mean could have made it to this level of success. Visit it now. WallClassifieds is both appealing and friendly. It has made it to this list as it satisfies what possibly any Craigslist alternative seeker may want to find. The largest number of counties that I have ever come across are covered by it and it’s easy to browse through. ClassifiedsFactor may not look as sharp as some of the other sites mentioned here; however, its ease of use and friendly menu items will ensure that it meets every expectation you might have had from a similar site to Craigslist. Visit it now! Aptdeco is quite famous to buy and sell used furniture. Simply list your product by following their given instruction. And they would visualize your item within 24 hours. Usually, you will find high ticket items at Aptdeco. Once the item is sold just provide the pickup date they will make the delivery on their own. Currently, they are providing their services in New York and new jersey but soon they are going to live in Boston and Philadelphia as well. This is one of the best sites like craigslist which locally focus through United States, United Kingdom, Canada, Europe and Asia. They offer free classified where a one-page site is created for the user. You just need to select the correct category and country to upload the ad. Oodle is one of the fastest growing classified in united states which also getting popular as an craigslist alternative. Oodle networks include multiple platforms like television broadcast, yellow pages, news paper, network portals and community sites. Listing is completely free and once you post the add it would be visible to multiple media and publishing sites. Apart from this you would also be able to promote your add through their Facebook page account. Their broader listing categories include rentals, real estate, jobs, pets, vehicles, services, personals and community. Posting add is very simple just create your account or you can also login through your Facebook account. Currently they are accepting registration from U.S, Canada, India, Ireland, New Zealand and United Kingdom. Once account is created simply click on post and supply the required details like category, pics, price and location. Recycler is the best alternative to craigslist for certain items like cars, Music, jobs, real estate, community, services, tickets, rent, and sports. And the best part of the website is neither you have to pay for listing nor any commission on sales. If you visit their website you would find their services are available in across U.S. Which is a major problem with craigslist alternative. Most of us must not be aware of this that Close5 is the rebranding of eBay classified. eBay not only deals in e-commerce but they also provide the service of classified. This is an app based platform where the customer can buy and sell items directly. Listing is free and here you can buy and sell almost everything from pets to house. Abadoo is a famous classified website in Europe which offers both free and paid listing with additional features. It is majorly active in France, Germany, Italy, Portugal, and Spain. Sites cover almost all spheres of listing but jobs, stuff for sale, services, property, and community are their broader category for listing. This website is a good competitor for craigslist especially in Europe. If you are in Australia then you must be aware how famous is Rackons as an craigslist alternative. Despite being hosted in Australia it allows users to post adds globally and it has a good presence over internet. they have huge organic traffic which makes this website more popular as a classified. Listing is free and they provide highly targeted traffic from google which helps audience to find the better deal. Rackons is gaining popularity steadily but soon you will be able to see this website getting popular in more countries. And if you are living in Australia then it could be more easy for you to explore and try. Usedeverywhere formerly, usedcanada.com is a Canada based website and has 73 classified networks in North America. They receive almost 2 million unique visitors and 50 million page views every month. 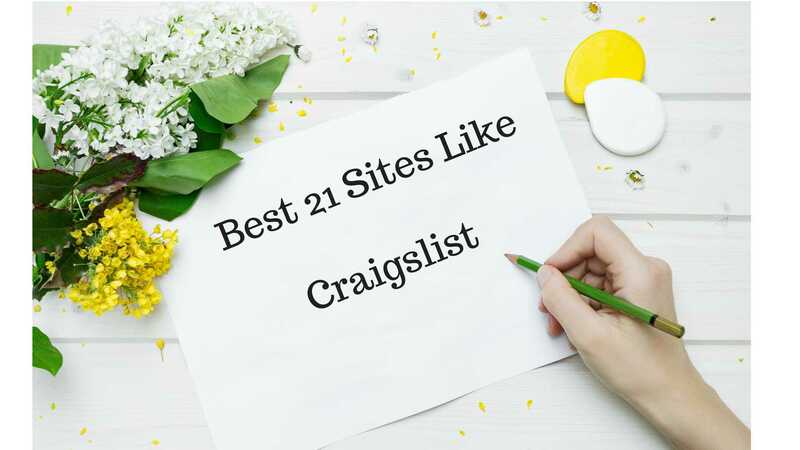 This is also considered one of the best Craigslist Alternatives as they have more than 24 categories to list the products. Locanto is also a very popular classified website which is majorly famous in U.s, Canada and Australia. But it actually operates in more than 50 countries around the world. Listing item is completely free and their categories include Jobs, pets, dating, classes, events, vehicles, personal, and real estate. it is one of the top site which is currently competing with craigslist and that is the reason we have included this site as craigslist alternatives. This is a classified site which supports app and compatible with cell phones also. Product listing is very fast and easy as you don’t need to do this on laptop or PC. Chatting feature is also available and this helps you to communicate with buyer and sellers in real time. In order to download the app just enter the mobile number and they will send you the link to download the app. This is perfect craigslist alternatives and operates Majorly in USA, Asia Pacific, Middle East, Australia, Latin America, Europe, Canada, and Africa. They provide a free listing for local and paid for multiple cities. Charges depend on country and number of weeks you choose to display the ad. They are top in this list of Craigslist competitors. Classified is a US based website similar to Craigslist. Account registration and the listing is completely free. You can post your ad for 30 days after that they will remove automatically. Categories like real estate, cars, pets, education, Finances, accounting, fashion, services, and jobs are allowed here. Users can add up to 12 images per listing and if they want they can upload video too. This helps to get the targeted audience and also helps you to increase the sales conversion. Another great website which could be considered one of the best craigslist alternative. Currently functioning in more than 23 countries and provide free listing to their users. Account registration is mandatory before posting an add and this also helps to minimize the risk of fraud. Usually the chances of frauds are very high on those website where registration is not required. You would find almost all the major categories which are part of craigslist. This site is just like Craigslist which allows free ad posting but limited to the US only. They provide categories like Farms & construction equipment, Vehicles. Merchandise, Services, Employment, Real Estate, Rental, Roommate, and Resumes. Apart from this they also provide to connect you with Geebo community across all states and country. Peerhub claims that they are a combination of eBay, Etsy, and Craigslist. And have major categories of vintage, handmade and used stuff. You can post the ad locally as well as globally and it’s also integrated with Facebook which makes it more convenient for registration and item listing. They also accept steem dollars which mean we don’t’ have to pay the fee of PayPal and credit card. PennySaverUSA started their business in the year 1962 when people used to stand in line in order to publish the ad in their newspaper classified. But now they have setup their online business too. All you need to do is provide your email id and select the right category. They deal in Arts, Vehicles, Food Dining, Jobs, Merchandise, Pets, real estate and services. Next step is to enter the correct headline with item description along with their charges. Finally, add some images and zip code and your ad is ready. USA today is most renowned circulated Newspaper of America which has both online and print classified. USA Today Classified is their online version. They have good categories like Auction, Automotive, Business, Careers, education, and notices. USfreeads is a Craigslist alternatives and operating since 1999. They have three types of membership Premium it would cost you $9.99/year, Gold $10/year and Basic which free but has limited exposure. They don’t allow adult content and prescription drug. However, they do allow affiliate links under paid membership. They include categories like Automotive, Collectibles, home & Gardens, Toys, Games, Models, Health & Fitness, employment, Clothing & Footwear, Announcements, Sports, Pets & Animals, Real Estates, Business opportunities, Hobbies & Leisures, Jewelry & Watches, Services and Wanted Ads. Adsglobe is also on the list of sites like Craigslist as it’s operating in more than 150 countries and serving over million locations globally. thousands of ads categories are available with image features and listing items is completely free. This is a UK based website launched in the year 2000 by two entrepreneurs Simon ckrookall and Michael Pennington. which majorly functioning in US, UK and South Africa. The website receives 8 millions of visitors and one million of new ads every month. They also have live chat support which works from 9 am to 9 pm. This is also one the big classified website similar to craigslist and operates globally. It includes the category of Homes, Cars, and jobs. Due to increasing illegal activities and frauds on craigslist. People are now shifting towards it’s alternative and another major reason is that there are lots of competitors out there who are providing targeted customers with full protection. So we have shared the list of best alternatives which you can choose according to your need. great job on this article! I hope you are making money off this website Your points are well formed. Such a deep answer! Incredible. Your posts is absolutely on point! I really love your writing style. awesome post! I was reading your website while camping. Now I feel stupid. I really appreciate your efforts and I will be waiting for your further blog thank you once again. Certainly a lot of info to take into consideration. I truly appreciate this page. You has interesting and great content. No complaints on this end, simply a excellent piece. You could survive a Zombie apocalypse. I feel like people should send you cash for this great material. Well written! There is ordinary, and then there is you. Your blogs is really useful. Readers like you are not less than a cash. keep reading our blog. This will definitely be very useful for me when I get a chance to start my article. A magnificent article. I bet old school Pinterest pros would love this. I have added your page to my Instagram You remind me of my bff. Geez, that is unbelievable. I know you would love Alabama. I bet top Tumblr pros would love your write up. I bet you make babies smile. Any team would be lucky to have you on it. Colors seem brighter when you are around.